JK Rowling has apologised for wrongly accusing Donald Trump of ignoring a disabled child - though not to the President himself. The Harry Potter author had called the US President "horrible" after a video appeared to show him refusing to shake the boy's hand in the White House. The widely-shared clip showed a wheelchair-bound boy, named Monty, reaching his hand in the air as Trump walked past without greeting him. It was branded "despicable" by Twitter users who said it made them feel "sick". 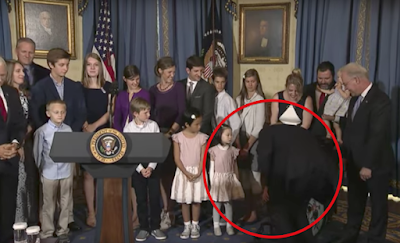 But the full clip of Trump's statement on healthcare showed he actually crouched down to greet the boy as he walked in, before starting his speech. Ms Rowling apologised after the boy's mother, Marjorie Kelly Weer, wrote on Facebook: "Trump didn't snub my son & Monty wasn't even trying to shake his hand." The Harry Potter author wrote originally: "How stunning, and how horrible, that Trump cannot bring himself to shake the hand of a small boy who only wanted to touch the President." Now the writer has "apologised unreservedly" in a series of Twitter posts - but pointedly refused to direct that apology to President Trump himself. She wrote: "Re: my tweets about the small boy in a wheelchair whose proffered hand the president appeared to ignore in press footage. "Multiple sources have informed me that that was not a full or accurate representation of their interaction. Ms Rowling has deleted her original tweets on the subject.